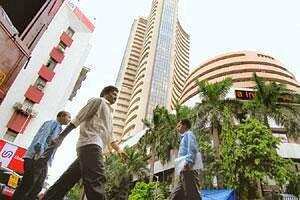 Mumbai: The BSE Sensex and NSE Nifty tumbled by nearly 4% to fresh two-year lows this week as markets witnessed the continued flight of foreign capital for the fourth week in a row amid a bearish sentiment in markets worldwide over the euro zone debt crisis. Investor wealth was eroded by about ₹ 1.69 trillion during the week. Lower-than-expected growth data from the US and China sent jitters through edgy investors apprehensive of a further slowdown of the global economy, which has seen the pullout of capital from equity markets worldwide. Heavy selling by Foreign Institutional Investors (FIIs), the main market mover, left the market distinctly weak. FIIs have pulled out ₹ 6,200.90 crore during the nine straight trading days since 15 November, including yesterday’s provisional withdrawal of ₹ 805 crore. Selling was seen across the board as 12 out of the 13 BSE sectoral indices closed in the red, with only the BSE healthcare index registering minor gains. The metal, consumer durables, refinery, FMCG, teck, banking, IT and power indices witnessed a decline. The 30-share BSE gauge dipped by 676.08 points, or 4.13%, to end the week at 15,695.43. It has lost 2,109.37 points, or 11.85%, over the past four weeks. The NSE’s 50-share Nifty index also fell by 195.75 points, or 3.99%, to 4,710.05. It has notched up losses of 650.65 points, or 12.14%, in the past four weeks.